I told myself I wouldn't be one of those persons. Showing non stop pictures of their baby, Throw in home movies, baby clothes discussion, blah blah blah.. But yes, I love her so much. I can't deny my obsession. Please don't hate me for I am human. Derek from the Alkaline Trio sent us this in the mail as a gift. Wow!! They sure know how to market every demographic. 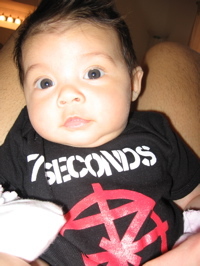 7 SECONDS has baby clothes. Amazing. We took Maggie to her first big party over the weekend. It was baby insanity. Ran into many new parents, but ya know... My baby is the best. No doubt about it. HA HA... Our friends Jackie and Mack have a 4 month baby boy named Everett. They seemed to get along quite well. And there you have it. 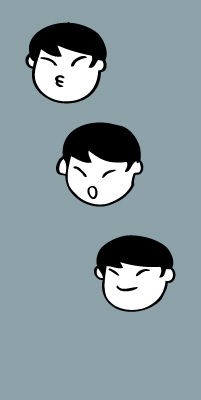 Enough baby talk to keep all of you away for long periods of time. Tomorrow night, I'm venturing to San Francisco to see the POLYSICS at the BOTTOM OF THE HILL. Top 5 best live bands in the world. Am I excited? Yes...very.